Budget 2012 has proposed that a life insurance policy be eligible for tax benefits only if the annual premium is 10 per cent or less than the sum assured on death. Sum assured under single-premium policies is usually less than 10 times the premium. LIC's Jeevan Vriddhi scheme, which was launched in March 2012 to attract people wanting to save tax, has created a buzz for offering guaranteed returns along with tax benefits. However, from this financial year, such single-premium schemes will lose charm as their sum assured on death is less than 10 times the annual/single premium. The Union Budget for 2012-13 has proposed that a life insurance policy will be eligible for tax benefits under sections 80C and 10(10)D of the Income Tax Act only if the annual premium is 10 per cent or less than the sum assured on death. This means the sum assured has to be at least 10 times the annual premium. This will hit single premium policies the most as their sum assured is usually less than 10 times the premium. Insurance companies usually launch single premium policies during the last three months (January-March) of a financial year, aimed at investors looking to save tax. As the main aim of these products is investment, insurers keep tenure (up to 10 years) and sum assured (1.25-5 times the single premium) low. Single premium unit-linked insurance policies, or Ulips, have a minimum sum assured of 125 per cent, or 1.25 times, the premium for policyholders below 45 years. It is 110 per cent, or 1.10 times, the premium for those above 45. 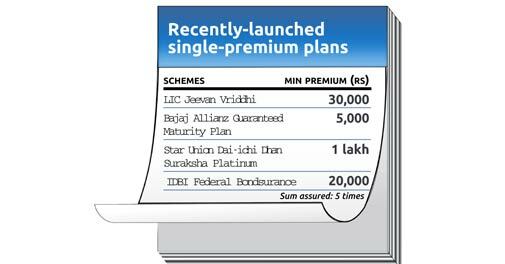 Traditional endowment single premium policies which offer guaranteed returns, such as LIC Jeevan Vriddhi, offer sum assured that is five times the premium. The Budget proposal means that either such policies come with higher death benefits or lose their tax benefits. Under Section 80C, investment up to Rs 1 lakh in government-approved schemes is eligible for deduction from the taxable income. Under Section 10(10)D, any amount received under a life insurance policy, including bonus, is not taxable. Vibha Padalkar, chief financial officer, HDFC Life, says insurance schemes which provide less than 10 times the sum assured will have to be re-launched. Higher death benefit means additional mortality charge (fee for providing death cover that is deducted from the premium amount) and hence a lesser amount for investment. The investment plans of insurance companies deduct all the related charges such as mortality, fund management, policy admin charges etc from the premium before allocating the remaining fund to debt or equity. The Budget proposal, though, will have no major impact on regular premium Ulips, which mandatorily offer a life cover of 10 times or more the annual premium to policyholders below 45 years. However, the minimum sum assured (seven times the annual premium) on Ulips for policyholders above 45 years has to be raised to at least 10 times if policyholders are to avail of the tax benefits. "The requirement of higher life cover of 10 times to gain tax benefits will put focus on the core objective of life insurance, which is to provide protection to the policyholder," says Shashwat Sharma, partner, insurance, KPMG India. It is pertinent to mention here that the Direct Taxes Code Bill pending in Parliament has proposed a minimum death cover of 20 times the yearly premium for an insurance plan to qualify for deduction under Section 80C of the Income Tax Act.